I'm moving flat and, yes, it is as traumatic as everyone says it is. Not only has my buyer been round six times and still hasn't exchanged contracts, but now she wants an early completion date. Pointing out you can't have the latter without the former has not had the desired result yet so I'm feeling a bit in limbo at the moment. Still I'm confident enough about the sale to start sorting and filling boxes. The bookshelf is the obvious place to start when you've amassed as many as I have over the years. The problem is you find yourself rediscovering old friends and reviving past relationships, and the 'discards' box remains empty. 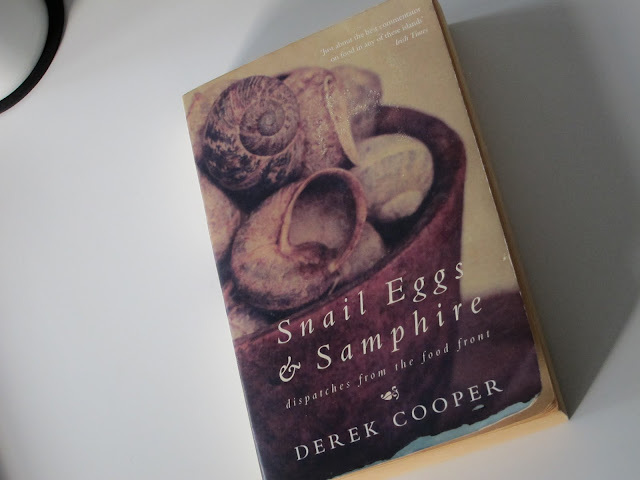 Amongst the books I found myself dipping into again today is Snail Eggs and Samphire by Derek Cooper, first published by Macmillan in 2000. It's sub-headed "Dispatches from the Food Front" and is a collection of his essays on food related subjects over the 30 preceding years. For me, Derek Cooper is the investigative food writer without equal. Starting his broadcasting career in Malaya, he then worked for the BBC on current affairs programmes. He switched to food journalism in the late sixties thanks to a piece on "Bad Food" which resulted in his book 'The Bad Food Guide'. Though he is probably best remembered as the writer and presenter of The Food Programme on BBC Radio 4. Now presented by Sheila Dillon, the programme still retains some of the campaigning agenda which Derek Cooper fearlessly pursued. He expertly teased out the truths about what we eat, holding multinational food producers to account when they were found wanting. In his words he exposed "places of ill-repute that destroy confidence in the way our food is being produced". He jointly broke the story on BSE (commonly known as 'mad cow disease'). Highlighted the use of polyphosphates in meat. Presented the truth about the disgrace of intensive chicken farms (sadly a battle still being fought by the likes of Hugh Fearnley Whittingstall). Derek Cooper's journalism is incisive and his humour and sense of irony make him a wonderful communicator and a much loved and trusted journalist and broadcaster. He has a deeply held belief that everyone, wherever they live in the world, has a right to good, unadulterated food. The annual 'Derek Cooper Award for Campaigning or Investigative Food Writing or Broadcasting' is the accolade most food writers would give their eye-teeth for. Cooper also brought good news stories. Championing good producers, practices and people. The essays in Snail Eggs & Samphire are disparate, making it perfect for dipping in and out of. Essays entitled Processing for Profit, The Roots of Hunger, Seeds of Profit and A Conspiracy of Silence are thought provoking. For his humorous side, look to Saving for the Future, On Being Cast Down, Pudding Lore and Ova the Odds. Thankfully much has changed over the 10 years since this book was published, a lot of it thanks to Derek Cooper. Worryingly, quite a lot hasn't. All this passion and the man doesn't even cook! Whatever else goes into the 'discards' box this week, Snail Eggs and Samphire is staying with me. Update 19 April 2014: RIP Derek Cooper who died today.